Money In Medicine – If Being Uninsured Is a Disease, then Money Is Medicine. If Being Uninsured Is a Disease, then Money Is Medicine. By Robert Pear, The New York Times, February 26th, 2019. WASHINGTON — Pharmaceutical executives, testifying before Congress, could not readily explain on Tuesday why the prices for many brand-name prescription drugs were much higher in the United States than in other developed countries. “It is almost as if the taxpayer has ‘stupid’ written on their face,” Senator Bill Cassidy, Republican of Louisiana, told the seven executives, who faced a barrage of questions and criticism at a three-hour hearing of the Senate Finance Committee. Mr. Cassidy joined two other Republican senators, Charles E. Grassley of Iowa and John Cornyn of Texas, and all the Democrats on the panel in expressing deep concern about constituents who could not afford the drugs they needed to survive. The hearing was political theater, but could also be a first step toward legislation to provide some relief to consumers, as lawmakers of both parties and President Trump have vowed to slow the relentless rise of drug prices. It was also clear from the hearing that senators had a lot to learn about drug pricing and that pharmaceutical executives did not fully appreciate the explosive political potential of the issue. “I feel like I need a Ph.D. in prescription drug pricing to understand how the heck this industry works,” said Senator Maggie Hassan, Democrat of New Hampshire. Richard A. Gonzalez, the chairman and chief executive of AbbVie, the maker of the best-selling arthritis drug Humira, told the committee that his company made profits in countries like Germany and France where prices of brand-name drugs were often much lower than in the United States. “The U.S. has some of the highest prices in the world,” Mr. Gonzalez said. “You’re willing to sit by and hose the American consumer while giving price breaks to consumers overseas,” Mr. Wyden said. Drug makers’ attempts to justify their prices, when so many patients cannot afford them, are “morally repugnant,” he said. The drug makers vehemently opposed Mr. Trump’s proposal for Medicare to pay for certain prescription drugs based on the prices paid in other developed countries. The Trump administration has said Medicare is paying 80 percent more than the amount other advanced industrial countries do for some of the most costly physician-administered drugs. Under its proposal, Medicare would still pay 26 percent more. But the drug company executives bristled at the idea. Under such proposals, they said, the United States would be importing price controls from other countries where coverage of costly new drugs is sometimes delayed or denied. “American patients have access to cancer medicines about two years earlier than patients in other countries, including Germany, France and the United Kingdom,” said Pascal Soriot, the chief executive of AstraZeneca. As a result, he suggested, American patients have generally seen greater improvements in cancer survival rates. Kenneth C. Frazier, the chief executive of Merck, said his company could not just walk away from European markets where health officials set lower drug prices. It would be “immoral to leave the patients behind,” he said. Mr. Cornyn said AbbVie had tried to block competition for Humira by surrounding it with a thicket of patents. In response to questions, Mr. Gonzalez, the chief executive, said AbbVie had 136 patents on Humira, with different patents protecting its use to treat different conditions. Mr. Cassidy expressed interest in an idea that has been embraced by many Democrats but few Republicans: that Medicare should, in some cases, be able to negotiate prices with drug manufacturers. “Right now,” Mr. Cassidy said, “Medicare has a very limited ability to negotiate” prices based on the relative value of a therapy. Medicare’s prescription drug plans, offered by private insurers, hire pharmacy benefit managers to negotiate, but they are not always effective, he said. Senator Sherrod Brown, Democrat of Ohio, said taxpayers subsidized pharmaceutical research, through the National Institutes of Health, and advertising, through tax deductions for business expenses. But, he noted, many drugs cost more than the median income of Medicare beneficiaries, about $26,000 a year. “We can’t afford to gave Big Pharma the blank check that you’ve had,” Mr. Brown told the executives. Mr. Grassley, the committee chairman, set the tone for the hearing when he said that practices of the pharmaceutical industry “thwart the laws and regulations designed to promote competition” and the use of lower-cost generic drugs. Several themes ran through the testimony of the drug company executives, who were clearly playing defense. The main problem, they said, is not the high list prices set by drug manufacturers, but the high out-of-pocket costs paid by patients. Several drug company executives suggested establishing a monthly or annual limit on a Medicare patient’s out-of-pocket costs for prescription drugs. Several chief executives, including Mr. Frazier of Merck and Olivier Brandicourt of Sanofi, said they could also support legislation that speeds the development of generic medications by requiring brand-name manufacturers to provide samples to generic drug companies. Generic drug developers need samples to show that a generic copy is equivalent to the original, but they have often had difficulty getting them. Ronny Gal, a securities analyst who follows the drug industry for Sanford C. Bernstein & Company, said he doubted that drug companies would change their pricing practices because of the hearing. Pharmaceutical executives do “want to be at the table for whatever comes next,” Mr. Gal said, and that could eventually include discussions and negotiations on legislation. Mr. Gonzalez, of AbbVie, said drug prices were a problem for some patients because their out-of-pocket costs were often a percentage of a drug’s list price. AbbVie, AstraZeneca and several other companies said they would reduce prices for consumers if Congress outlawed the rebates that drug makers pay to insurers and middlemen to promote the use of their drugs in Medicare and commercial insurance. Democratic senators wanted a firmer commitment. They asked the drug company executives to put it in writing. Albert Bourla, the chief executive of Pfizer, said he supported efforts to eliminate rebates paid to health plans and middlemen. Patients, he said, should get the benefit of such price concessions at the pharmacy counter. “None of the close to $12 billion of rebates that Pfizer paid in 2018 found their way to American patients,” Mr. Bourla said. With the proliferation of high-deductible health plans, Mr. Bourla said, patients are paying a larger share of prescription drug costs. “Patients are made to pay on average 14 percent of the cost of their medicines, but only 3 percent of the costs associated with hospital stays,” he said. Patients, doctors and members of Congress have cited rising insulin prices as an example of what is wrong with drug prices in America, and Mr. Brandicourt, the Sanofi chief executive, defended the company’s record. A version of this article appears in print on Feb. 26, 2019 , on Page B6 of the New York edition with the headline: Drug Makers Try to Justify Higher Costs at Hearing. Watching administration officials play cat and mouse with Sunday talk show hosts is a hoary Washington tradition. But yesterday, Trump spokesmen offered a remarkably large number of flat out untruths as they attempted to defend the Republican health care plan. – Tom Price, Secretary of Health and Human Services, on Meet the Press. 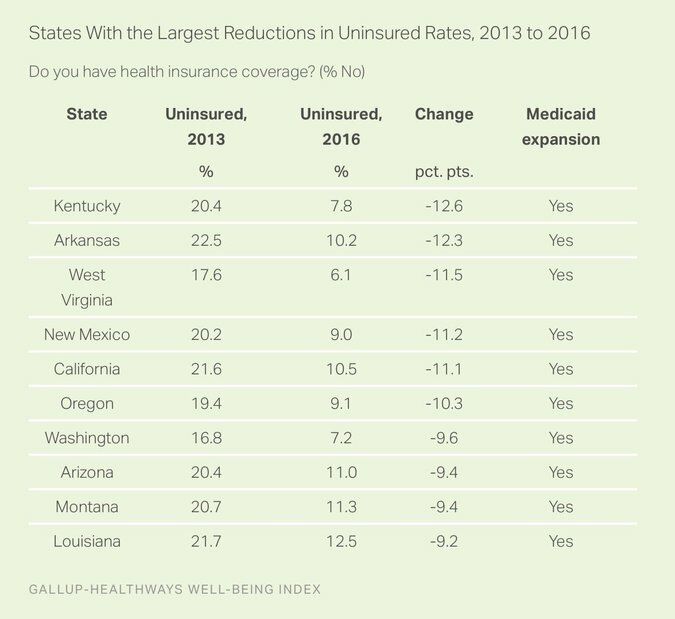 For those in the 31 states and the District of Columbia that are participating in the Medicaid expansion, Trumpcare will provide far less Federal support, as the chart below indicates. After 2020, states will no longer be able to accept additional enrollees and no one who loses eligibility (such as by getting a higher paid job) will be able to return to the program even if their income drops. All told, the Administration plans to save $370 billion over the next 10 years from these cuts – which will surely make many Americans worse off. That’s two misstatements in quick succession. The plan to repeal $600 billion of taxes that almost entirely benefit the wealthy is very much at the heart of the matter. Those revenues are currently being used to expand Medicaid for the poorest Americans and subsidize health insurance for families with incomes between $24,600 and $98,400 per year. Removing a large chunk of those subsidies surely makes health care less affordable for those with lower incomes. What is he talking about? Of the 11 million people who are buying health insurance coverage through the exchanges, all but 1.7 million are receiving subsidies through Obamacare. As the drop in the total number of uninsured indicates, it’s impossible to imagine that most of them were previously buying unsubsidized insurance directly from providers. —Mr. Mulvaney on This Week. President Trump was very clear during the campaign: “We’re going to have insurance for everybody,” he said in an interview with the Washington Post on January 14. “Much less expensive and much better.” According to early estimates from Standard & Poor’s and Brookings, between six and 15 million Americans would lose insurance coverage under Trumpcare. That’s technically true but of course, with or without any federal assistance, individuals are always free to buy health insurance. Mr. Cohn’s comment came in response to repeated questioning by host Chris Wallace about what would happen to the more than 20 million people who have gained coverage under Obamacare. As noted, it’s inconceivable that millions of Americans who are currently insured won’t lose their coverage. Evaluating complex policy proposals is, indeed, difficult but Mr. Mulvaney’s apparent preferred alternative – doing no impact analysis at all – makes no sense. Just because weather predictions are often wrong, would you not check the forecast before you venture outside? Finally, a reminder to Mr. Mulvaney: The current director of the C.B.O., Keith Hall, was picked by the Republican leadership on Capitol Hill and served in the administration of President George W. Bush. The Affordable Care Act was crafted with a mix of tax increases and Medicare cost cuts alongside the new benefits in order to – shockingly – provide a modest amount of deficit reduction. Over its initial decade, the entire Obamacare package was projected to reduce the total deficit by $124 billion. In addition, in its most recent assessment, the C.B.O. said repealing Obamacare would increase the deficit by $353 billion between 2016 and 2026. 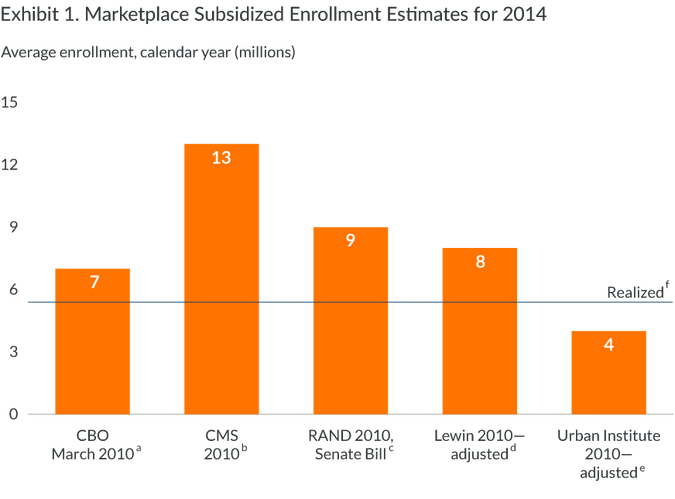 Furthermore, the net expenditures on coverage have been revised down several times. In 2010, the C.B.O. projected that benefit costs would total $132 billion in 2016; by last year, that estimate had been reduced to $110 billion. That often-cited statistic applies only to individuals who buy unsubsidized insurance through the exchanges (1.7 million people) and those who get their insurance directly from providers (another six million Americans). These two groups account for just 3 percent of Americans. And while by talking about “last year alone,” Mr. Cohn implies that this is the latest of a long string of large increases, in fact, premiums increased by 7 percent in 2016 and 2 percent in 2015. He is talking about people whose incomes are well below median levels and is offering them the opportunity to save money they don’t have and get the benefit of taxes they generally don’t pay because their incomes are too low. 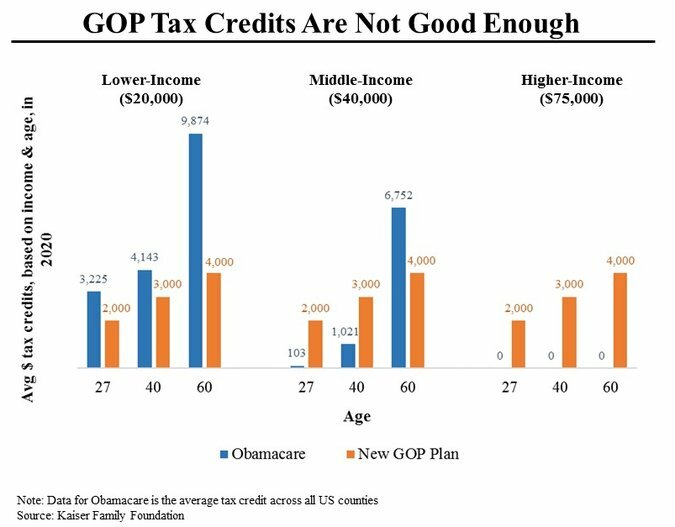 How does taking away the Obamacare benefits and giving them refundable tax credits of $2,000 to $4,000 per person replace subsidies that currently run to as much as $9,874 for older low-income individuals? Mr. Mulvaney didn’t provide enough information for me to be sure but for one thing, the out-of-pocket maximum for a marketplace plan in 2016 was $13,700. For another, while Mr. Mulvaney is correct that senators and representatives are required to buy their insurance through the District of Columbia exchange, they get a pretty good deal. According to Congressional Research Service, if they buy a gold plan, the government (meaning us taxpayers) paid up to 75 percent of the premiums. I went to the District of Columbia health care exchange and for a family of 5, like the Mulvaneys, the yearly cost of plans currently being offered is approximately $25,000. That would mean premium costs of just over $6,000 a year. The required deductibles range from zero to $2,000. So I have no idea where Mr. Mulvaney’s assertion came from. Steven Rattner is a Wall Street executive and a contributing opinion writer. Republicans’ “health care” bill is not really about health care. It’s not about improving access to health insurance, or reducing premiums, or making sure you get to keep your doctor if you like your doctor. And it’s certainly not about preventing people from dying in the streets. Instead, it’s about hundreds of billions of dollars in tax cuts — tax cuts that will quietly pave the way for more, and far larger, tax cuts. From the bill text, we can tell the directionality of some of the changes Republicans are proposing — i.e., tax revenue will fall, lots of people will lose health coverage and the Medicare trust fund will be exhausted sooner. But we still don’t know the magnitude of these changes — i.e., how much, how many or when, respectively. We don’t know the answers to these questions yet, because Republicans don’t want us to know them. Part of the reason they have rushed the bill through committees is to front-run an (inevitably unflattering) analysis from the nonpartisan Congressional Budget Office. In the meantime, other experts and government bodies have scrambled to compile their own estimates for the bill’s effects. The ratings and analytics firm S&P Global has ballparked the number of people who would lose their insurance at 6 million to 10 million; others have offered figures as high as 15 million and 20 million. Meanwhile, a group of health researchers calculated that the bill would increase costs for enrollees on the individual insurance market by, on average, more than $1,500 per year when it would take effect, and by more than $2,400 per year by 2020. Oh, and the Medicare trust fund would be exhausted by 2024, according to Brookings Institution researchers. For those keeping score, that means fewer people would have insurance, those who get insurance on the exchanges would pay a higher price for it and Medicare’s solvency would be jeopardized as a bonus. On the other hand, it’s quite easy to see how another well-established Republican goal would be achieved: tax cuts. Specifically, $600 billion of them, predominantly benefiting the rich. The Joint Committee on Taxation has released a series of estimates showing what some of the tax-related provisions of Trumpcare would do. Among the biggest are repeals of two ACA surtaxes on the highest-earning Americans: a 0.9 percent payroll tax add-on and a 3.8 percent tax on net investment income for couples whose incomes exceed $250,000 ($200,000 for individuals). Repealing these would cost $275 billion over the next decade. The law also axes other taxes, such as the tanning tax (once nicknamed the Snooki Tax, but now apparently a symbol of patriarchal oppression), and excise taxes on insurers; drug manufacturers and importers; and medical-device manufacturers and importers. Based on what the Joint Committee has scored so far — and it has not analyzed every revenue loser in the bill — these tax cuts come to about $600 billion. The presence of expensive tax cuts in a bill purportedly about health-care reform is not a side effect; it’s the entire point. They make it easier for Republicans’ (much bigger) individual and corporate tax cuts to sail through the Senate with minimal Democratic obstruction in a few months’ time. Why? Under normal circumstances, Democrats would almost certainly filibuster the coming tax overhaul, preventing it from ever getting to a vote. But Republicans can take the filibuster option away by using the “reconciliation” process, which is an option if, and only if, the tax bill doesn’t increase government deficits in the long term, relative to existing law. How do you keep tax cuts from increasing deficits relative to existing law? One useful tool is to change existing law — that is, to move the goalposts. Cutting taxes in the Obamacare repeal bill today lowers the revenue baseline against which a tax overhaul plan will be judged tomorrow. So for those who have been scratching their heads about why Republican leadership is standing by a “health care” bill that does nothing to improve access to health care, remember: When you hear hoof beats, think tax cuts. Don’t Try to Fix Obamacare. Abolish It. As Republicans in Washington grapple with altering the Affordable Care Act, they have proceeded in a direction that will do little to curb the cost of health care in America. Instead, they are pushing a bill that, according to the Congressional Budget Office, might save the government money, but will end coverage for 24 million people (though several million of those would be willingly giving up coverage the law now requires them to have). If it passes, Republicans will not only own the nation’s health care problems for years, but they will also have violated more than six years of promises. Since 2010, Republicans have pledged to repeal — not fix, not tinker with, but abolish — Obamacare. In 2016, that was a centerpiece of Donald Trump’s campaign. Republicans ran advertisements noting they had voted 70 or more times to repeal the Affordable Care Act, and they would do it as soon as they had control of Congress and the White House. Voters gave them just that. And now Republicans, who had used the word “repeal” like a meditation chant, act like the proverbial dog that caught the car. 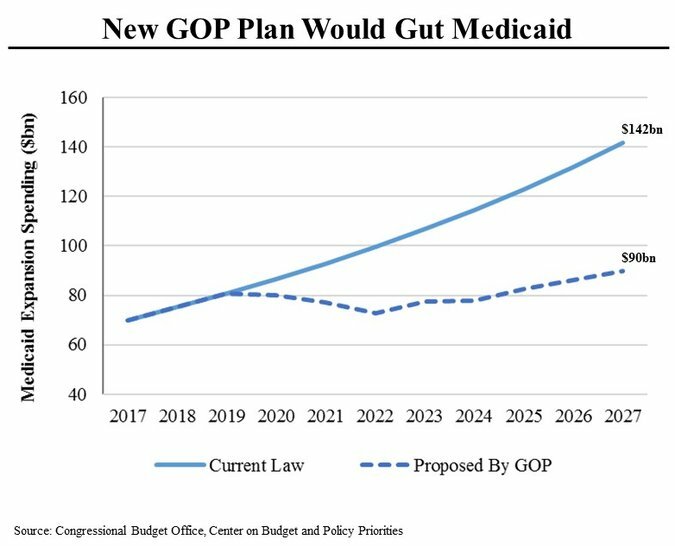 The plan they all liked in 2015 — one that would have ended the law’s mandates, subsidies and Medicaid expansion — would not pass today. Yes, Republicans, you really did once author a plan to credibly repeal Obamacare, unlike what you are considering now. Of course, Republicans are acting this way in large part because of President Trump’s voters. Despite all the hard talk about repealing Obamacare, Mr. Trump’s voters supported a man who promised a government-run health care plan that would provide universal coverage. In other words, he promised more than Obamacare. For that matter, Mr. Trump promised more government involvement in health care than Hillary Clinton did. It is not hard to see why Republicans think they can get away with breaking their promises. Their own party’s presidential nominee promised more than what President Obama offered and claimed he could pay for it all without raising taxes. Mr. Trump’s voters want Obamacare, but they want Mr. Trump’s gold-plated branding on it. They claim to hate Obamacare, but data show a good number of Mr. Trump’s voters are actually using the Affordable Care Act. Just don’t tell them that the Affordable Care Act is Obamacare. They like the former and hate the latter. The 2016 election was, though it pains me to say, a defeat for conservatism. Both parties were willing to gravitate toward candidates who promised a strong federal government that could deliver a panacea without worrying about costs. Mr. Trump promised to be a strong man stamping out waste, fraud and abuse while putting Americans first. His voters are smart enough to understand that his programs will cost money. They just do not seem any more concerned than Republican leaders in Washington about budget costs. They all make a great show of caring in public, but it is just show. So Democrats and Republicans are fighting over who gets to expand government for which voters and by how much. The Republicans, who claim to be the party of fiscal discipline, want to spend money, but at a slower pace than the Democrats and without raising taxes. It did not have to be this way. The Republicans did not have to embrace the Democrats’ presuppositions in creating Obamacare. Despite the name “Affordable Care Act,” the Democrats were far more focused on expanding coverage and ensuring every American could get insurance than they were on making coverage affordable. When Republicans decided to amend Obamacare, they too focused on the numbers covered. Instead, they should focus on cost. If Republicans stopped worrying about how many people had access to a government-managed health care program and started focusing on reducing costs, they could potentially increase the number of people covered. Doing so would necessitate scaling back the government’s involvement in health care, reducing insurance mandates, unleashing free-market competition among insurance providers and allowing consumer choice in selecting plans. Increasing competition and choice would lower prices for all kinds of insurance. Lower prices would free up corporate dollars for other things like innovation and jobs. Lower prices would also make it far more affordable for Americans to buy their own insurance than wait for government to subsidize it. For conservatives like me, however, it appears the train has left the station. Democrats and many Republicans are invested in the idea of involving government in our basic health care choices. The Republicans are even keeping President Obama’s individual mandate, though in repackaged form. Americans are increasingly cynical about politics. Watching Republicans campaign for years on repealing Obamacare only to see the effort collapse will just increase that cynicism. But the reverse is true, too. Watching many Americans demand repeal, while voting for a man who promised a government-run, universal coverage solution, only increases politicians’ cynicism about the American voter. The voters know the politicians will break their promises once elected. The politicians know the voters will let them get away with it as long as the spoils of victory are divvied up. Paying the bill will be a problem for some other day. Erick-Woods Erickson is the editor of the website The Resurgent and a talk-show host on the radio station WSB. Author moneyinmedicinePosted on April 8, 2017 April 8, 2017 Categories UncategorizedLeave a comment on Don’t Try to Fix Obamacare. Abolish It. Can you get what you need in a government-run health-insurance market? Virtually all current health-care-reform plans feature a monopoly health-insurance store, operated by federal or state governments, for those who lack employer- or government-sponsored insurance and want to qualify for government subsidies. Advocates claim these monopoly markets will control costs through their purchasing power and enhance price competition by simplifying comparison shopping. When insurers are forced to compete on price, they will prod health-service providers for increased efficiency. It’s true that retailing innovations can enhance productivity. The retailing sector is credited for 34 percent of the 1995–1999 surge in U.S. labor productivity and continuing growth through 2002; retailers achieved these results through innovations such as convenient web outlets (eBay, Amazon, Netflix); inexpensive, stylish goods (IKEA, Target); and widening ranges of products that enhanced competition, a trend that produced more than 170,000 book titles, 211 car models, and countless custom-designed PCs. But before we get swept away, let us remember that these health-insurance markets would be monopolies run by government, two characteristics that normally do not enhance consumer welfare. Picture the efficiency of your Division of Motor Vehicles, for example. Also consider government-run monopoly liquor stores. Despite their ability as the single payer to extract better volume discounts from wholesalers than private liquor chains can, their prices are not lower than private stores’. Additionally, they slight consumers through shorter operating hours, inconvenient locations, limited brand availability, and inadequate advertising. By forcing consumers to adjust their shopping habits, they raise prices through loss of time. Although some advocates hope that these features limit liquor consumption, this is not the case. The results attained by government-run health-insurance markets in Massachusetts and the Netherlands provide equally cautionary evidence: Such markets limit competition, do not control costs, discourage entrepreneurial efforts, and thus cause consumer dissatisfaction. Government health-insurance markets limit choice, through plans with standardized benefits packages — insurance speak for “you can have it in any color as long as it is black.” Massachusetts’s government-designed insurance policies require enrollees to purchase 52 benefits, some of them very costly. In vitro fertilization, for example, raises the price of insurance by up to 5 percent by itself. We all should empathize with families needing in vitro fertilization, but is this the kind of medical care for which insurance is designed, and if not, is it fair to raise everybody’s family insurance prices by as much as $900 (at 2009 insurance rates) to pay for it? Most likely, many consumers would not buy all of these government-required benefits if they had freedom of choice. For example, Swiss consumers — who are required to buy their own health insurance — are demonstrably price sensitive. There’s no reason to believe that Americans are any different, and researchers at a recent event at the American Enterprise Institute claimed that 12 million uninsured would find affordable insurance if they could shop for plans that required fewer benefits. Monopoly markets run by the national or state government obviate that possibility. Why do government-controlled markets require insurance plans that people may not want and prohibit others they may want? The reason is simple: Legislatures that run government markets respond to lobbyists financed by providers and insurers. These interests prefer to sell expensive policies rather than cheap ones; and no one lobbies for consumers. Also, the politics of empathy play a role: People with uncovered conditions often lobby, through the government and media, to force insurance companies to cover their maladies. Government-run markets pose additional dangers. By “crowding out” employer-sponsored insurance, the government’s regulatory power enables the market to become a complete monopoly. In Massachusetts, for example, subsidies available only to the non-insured (for example, families of four earning up to $66,000) and relatively low penalties for employers who do not offer health insurance have already caused enrollment in employer-sponsored health insurance to slip from 85 percent in 2003 to 78 percent in 2007. Similarly, employer contributions for the payment of policies declined from 82 percent in 2001 to 75 percent, compared to 85 percent nationally, in 2007. A monopoly government-run market can limit the entrance of innovative insurance plans. Consider the decade-long results achieved by an entrepreneurial South African insurer that financially rewarded joining gyms, screening for chronic diseases, and smoking cessation. Highly engaged members (up to 38 percent) achieved significant cost reductions, most notably in chronic diseases, which account for the bulk of health care costs — 7.2 percent lower for cardiovascular disease, 15.1 percent for cancers, and 21.4 percent for endocrine and metabolic diseases. Government markets can also limit innovation through price setting. In the Netherlands, for example, the government controlled all the prices paid to suppliers. When it permitted hospitals and insurers to negotiate freely for a limited number of procedures, prices dropped, some hospitals offered warranties for their services, and insurers offered innovative policies, such as paying enrollees’ deductibles if they used lower-priced hospitals. Rather than entrepreneurialism, government-controlled markets encourage consolidation. In anticipation of the government market “reform,” for example, Dutch insurers consolidated to control 80 percent of the market. The providers consolidated, too, so they could bargain effectively with these oligopolistic insurers. In the U.S., the economies of scale that such mergers allegedly achieve have not occurred. To the contrary, U.S. hospital and insurance mergers have increased prices and at times diminished quality. Competition, however, lowers costs. Switzerland has 84 private-sector insurers, and they’ve lowered their general and administrative expenses to 5 percent of their total costs, a percentage equal to, and likely better than, the administrative costs of the monopolistic government Medicare program. Limited choice, little price differentiation, consolidated insurers and providers, lack of entrepreneurs — this deadly brew causes price inflation. In the Netherlands, while total health-care-cost increases declined two years before the national market reforms, total costs rose by 4.4 percent and 5.1 percent, respectively, in the two years after the reforms were put into place. Individual health-insurance premiums rose about 8 to 10 percent in 2006–2007 and even more in 2008. Not surprisingly, the Dutch are unhappy with their insurance plans and the perceived quality of their health care. Some contend the American public needs a centralized market offering a limited choice of plans with standardized features because it is essentially too stupid to wend its way through a thicket of insurance plans. But, in the rest of the U.S. economy, Americans have driven down the price and improved the quality of complex purchases such as personal computers and cars. Automobile prices, for example, have inflated by only 35 percent since 1982–1984, while the CPI index more than doubled. And Americans wend their way through 43,000 items carried by the average food retailer to get what they want. When it comes to health insurance, the appropriate role of government is to help subsidize those who cannot afford health insurance; to enable transparency so that people can shop intelligently; and to prosecute fraud, abuse, and anti-competitive behavior. It’s not the government’s job to run markets. Regina Herzlinger, the Nancy R. McPherson professor of business administration chair at the Harvard Business School and fellow at the Manhattan Institute, is author of Who Killed Health Care: America’s $2 Trillion Problem — and the Consumer-Driven Cure. Several readers have asked me a good question: we rely on free markets to deliver most goods and services, so why shouldn’t we do the same thing for health care? Some correspondents were belligerent, others honestly curious. Either way, they deserve an answer. It comes down to three things: risk, selection and social justice. First, about risk: in any given year, a small fraction of the population accounts for the bulk of medical expenses. In 2002 a mere 5 percent of Americans incurred almost half of U.S. medical costs. If you find yourself one of the unlucky 5 percent, your medical expenses will be crushing, unless you’re very wealthy — or you have good insurance. But good insurance is hard to come by, because private markets for health insurance suffer from a severe case of the economic problem known as ”adverse selection,” in which bad risks drive out good. To understand adverse selection, imagine what would happen if there were only one health insurance company, and everyone was required to buy the same insurance policy. In that case, the insurance company could charge a price reflecting the medical costs of the average American, plus a small extra charge for administrative expenses. But in the real insurance market, a company that offered such a policy to anyone who wanted it would lose money hand over fist. Healthy people, who don’t expect to face high medical bills, would go elsewhere, or go without insurance. Meanwhile, those who bought the policy would be a self-selected group of people likely to have high medical costs. And if the company responded to this selection bias by charging a higher price for insurance, it would drive away even more healthy people. That’s why insurance companies don’t offer a standard health insurance policy, available to anyone willing to buy it. Instead, they devote a lot of effort and money to screening applicants, selling insurance only to those considered unlikely to have high costs, while rejecting those with pre-existing conditions or other indicators of high future expenses. This screening process is the main reason private health insurers spend a much higher share of their revenue on administrative costs than do government insurance programs like Medicare, which doesn’t try to screen anyone out. That is, private insurance companies spend large sums not on providing medical care, but on denying insurance to those who need it most. What happens to those denied coverage? Citizens of advanced countries — the United States included — don’t believe that their fellow citizens should be denied essential health care because they can’t afford it. And this belief in social justice gets translated into action, however imperfectly. Some of those unable to get private health insurance are covered by Medicaid. Others receive ”uncompensated” treatment, which ends up being paid for either by the government or by higher medical bills for the insured. So we have a huge private health care bureaucracy whose main purpose is, in effect, to pass the buck to taxpayers. At this point some readers may object that I’m painting too dark a picture. After all, most Americans too young to receive Medicare do have private health insurance. So does the free market work better than I’ve suggested? No: to the extent that we do have a working system of private health insurance, it’s the result of huge though hidden subsidies. Private health insurance in America comes almost entirely in the form of employment-based coverage: insurance provided by corporations as part of their pay packages. The key to this coverage is the fact that compensation in the form of health benefits, as opposed to wages, isn’t taxed. One recent study suggests that this tax subsidy may be as large as $190 billion per year. And even with this subsidy, employment-based coverage is in rapid decline. I’m not an opponent of markets. On the contrary, I’ve spent a lot of my career defending their virtues. But the fact is that the free market doesn’t work for health insurance, and never did. All we ever had was a patchwork, semiprivate system supported by large government subsidies. That system is now failing. And a rigid belief that markets are always superior to government programs — a belief that ignores basic economics as well as experience — stands in the way of rational thinking about what should replace it. Not the droids you’re looking for? Money In Medicine Blog at WordPress.com.